Dr. Sterling Nesbitt is an Assistant Professor of Geosciences at Virginia Tech, as well as a research associate/affiliate of the American Museum of Natural History, the Vertebrate Paleontology Lab at The University of Texas at Austin, the Virginia Museum of Natural History, North Carolina Museum of Natural Sciences, and the National Museum of Natural History. He received his BA in Integrative Biology from the University of California, Berkeley and went on to complete his MA, MPhil, and PhD in Geosciences at Columbia University. Afterwards, Sterling conducted postdoctoral research at the University of Texas at Austin, the University of Washington, and the Field Museum before joining the faculty at Virginia Tech where he is today. Sterling is the recipient of the 2016 Virginia Tech College Award for Outreach Excellence from the College of Science. Sterling is here with us today to speak to us about his life and science. Sterling is passionate about travel. He loves visiting new places to experience other cultures, learn about their traditions, and discover fantastic places off the beaten path. Scientifically speaking, Sterling is a vertebrate paleontologist who leverages his training in biology to understand how animals are related, how they evolved certain features, and how they have diversified over time. He is working to improve our knowledge of how life on earth has evolved over the past hundreds of millions of years. Initially, Sterling was captivated by archaeology, but his interests shifted to paleontology in junior high through visits to the Arizona Museum of Natural History where there were rich collections of fossils. Sterling participated in their Tuesday Fossil Nights where he would listen to a presentation and work on preparing fossils. This introduced him to the excitement of being the first person ever to see a parts of ancient creatures that no one else had seen before. When Sterling was 15 years old, the remains of a mammoth were discovered in the nearby Phoenix Basin. He had to see it. While at the site, Sterling discovered a piece of mammoth tooth in the discarded dirt pile and was invited by scientists to help with the rest of the excavation. He spent days reveling in a trench in the 110 degree Arizona heat hunting for fossils and has continued to search for fossils ever since. Trying to find fossils is riddled with challenges and failures. As a paleontologist, Sterling does his best to target areas that he thinks will contain fossils that will allow him to answer his research questions about the evolution of dinosaurs of other reptile groups. However, he sometimes has to pivot or modify his questions when the desired field sites are impossible to get to without helicopters or he doesn’t find any fossils. Once a fossil is found, Sterling faces a variety of challenges in excavation because numerous measures must be taken to protect the bones while they remove and transport them. Few fossils of the early relatives of birds, crocodiles, and dinosaurs have been found in the world, and Sterling was determined as an undergraduate to find one of these specimens. In 2002, Sterling led his first small expedition, and the team discovered a fairly complete skeleton of a pre-dinosaur animal known as Arizonasaurus. Previous evidence of this animal was limited to just small bone fragments. This was a huge success that revealed some unexpected characteristics of the animal and helped launch Sterling’s career. Tanzania opened up Sterling’s eyes both scientifically and culturally. He has spent a lot of time working in the field in Tanzania in places that tourists don’t visit. While there, he and his team stay in villages and enjoy interactions with the local people. Sterling had previously done most of his fossil hunting in deserts where there is a lot of exposed rock, and fossils are easier to find. In Tanzania, everything is covered in plants, and there are only a few places with exposed rocks. They often have to trek through fields of 7-10 foot tall elephant grass to get to the field sites, and finding fossils is much more difficult. Sterling and the members of his research group conduct their field work together each summer, and they have been working at a site in northern New Mexico for 11 years. The scientific questions are important in choosing their field sites, but they also try to plan their destinations around their favorite restaurants in the area. It’s a long road trip from Virginia to New Mexico, and Sterling and his team make sure to stop at all of their favorite restaurants along the way as well. In the wise words of one of Sterling’s former professors Dr. George Brimhall: “Always know what’s under your feet.” From a geological sense, it is important to understand the structure and characteristics of the rocks around you, but also, in a more general sense, to appreciate where you are each moment and observe the world around you. As you go through your own journey, explore your world. Try to understand as much as you can about the cultures and landscapes of the world today as well as appreciate the past and the history of our world. Sterling’s research group at Virginia Tech centers on the evolution of vertebrates, particularly reptiles, over the last 300 million years. He is interested in influences of Earth processes on macroevolutionary events (mass extinction and adaptive radiations), morphological and taxonomic diversity, the consequence of latitudinal differences on an organism’s biogeography, comparative methods in phylogenetics, developmental influences on convergent evolution, and faunal evolution. A specialist on the reptile group that includes dinosaurs, birds, and crocodylians, Sterling is particularly interested in the rise of the living reptile fauna from its roots 230 million years ago. Most recently, he has started to incorporate questions focused on morphological change in invasive reptiles in Florida into his research program. He resides in the Department of Geosciences, but also works closely with faculty in Biosciences and is a member of the Global Change Center at Virginia Tech. Sterling teaches undergraduate courses focused on Earth History (Earth and Life Through Time) and team-teaches an intense First Year Experience course for new Geosciences majors. At the Graduate level, he teaches Vertebrate Evolution and has taught a seminar on mass extinctions through time. His fieldwork has taken him to Tanzania, Zambia, South Africa, Madagascar, Argentina, Mongolia, and all over the United States. 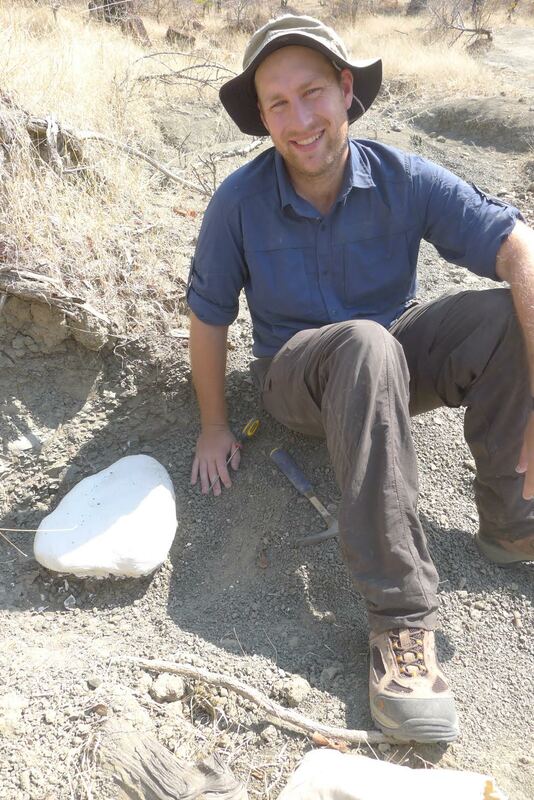 Dr. Nesbitt has published more than 75 peer-reviewed contributions on subjects ranging from the evolution of individual bones in reptiles (e.g., the furcula of birds, the eye “bone” of crocodylians) to macroevolutionary patterns of early dinosaurs.